Shopping for interior glass French doors? Ambiance® is committed to providing customers with interior glass French doors that are not only elegant and attractive, but also high in quality and affordable. Our decorative glass interior doors are beautiful and visually exciting alternatives to standard interior doors. Ambiance® interior glass French doors serve a number of functions. They can be used as French interior doors, pocket doors, sliding doors, pantry doors, pivoting doors, or as room dividers. Our doors can serve your needs as double doors or, if you use one alone, as a single French door. Our doors come unfinished in pine with textured glass inserts for use as French interior doors. Ambiance® interior glass French doors are a beautiful addition to any home. You may be an interior decorator and want to use textured glass doors or etched glass doors. 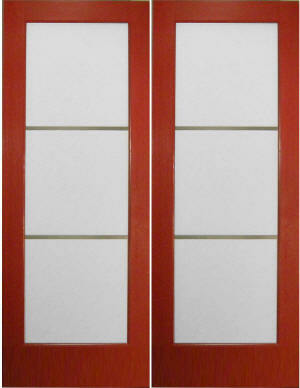 Perhaps you are a home builder and plan to use high quality and affordable French interior doors. You may be decorating or adding a room to your own home, and want glass interior doors to separate your new addition or, to save space, you may want to use them as sliding glass pocket doors.